Twin Towers ( T7,W4,I5,N1 ) = 17, ( T7,O2,W4,E5,R5,S6 ) = 29, 17+29 = 46. Reflecting Absence ( R5,E5,F6,L2,E5,C3,T7,I5,N1,G7 ) = 46, ( A1,B2,S5,E5,N1,C3,E5 ) = 23, 46+23= 69. Here we find the numbers 17, 23, 29, 46 and 69 for starters. We will be breaking these down using decimal parity as needy for deeper meaning. Starting with the number 17 we have the following words with this same value Magic, Cast, Past, Pineal, Evil, Live, Moment, Goat, Family, Nation, Floor and my favorite Embryo. Please take note 17 is the 7th. prime number and when adding the numbers 1-17 it equals 153. Total number killed in attacks in New York: 2,753, 2+7+5+3 = 17, 1+7 = 8, 17 babies were born on the site of the Twin Towers, 71 ( mirror number ) escalators and the number of families who received no remains: 1,717. According to biological science we know it takes at least 23 chromosomes from the male and 23 from the female to create an embryo. ( 46 ) For the number 23 we find, Heaven, Circle, Kingdom, Temple, Death, Grave, Dust, Wrath, Youth, Split, Fish, Mutant, Haploid, Mirror, Event and Eleven ( imagine that ) . Has your curiosity been awakened yet? If not the number 29 may give it a little spark. See if these words trigger anything Vessel, Nothing, Incarnate, Metatron, Osiris, Forsaken, Fringe, Victory, Jehovah, Feminine, Elemental, Red Blue, Alpha Omega, Enki Enlil, Creation and Male Female. For most readers this will be beyond their imagination ( I MAGI Nation ) and it is with great passion the authors goal is to help stretch beyond the obvious and look at all possibilities within the Game of Life. We are just getting started so fasten up your seatbelt and hang on for what could be the ride of your LIFE. This author has written many articles about the number 8 ( Pi ) and the connection between what he calls the infected embryo known as SIN aka fall of man ( F6,A1,L2,L2 ) = 11, ( O2,F6 ) = 8, ( M1,A1,N1 ) = 3, 11+8+3 = 22, 2+2 = 4. Twin Towers 110 stories each, 110+110 = 220 = 22 = 4. Everything in this Game revolves around controlling the embryo ( energy ) ION ( I5,O2,N1 ) = 8 at the moment of creation as we know it. This World Trade Plaza consisted of 6 buildings within a block bordered by these 4 streets Vesey, West Side Highway, Liberty, and Church. West Side Highway aka West Streets, originally designated NY 9A north of the Holland Tunnel and NY 27A south of the Holland Tunnel. Building 7 was outside of this area. Vesey Street is named for Rev. William Vesey, the first rector of Trinity Church, who served from 1697 until 1746, how ironic is it these Towers Jachin and Boaz located in Lower Manhattan are bordered by streets with these names. noun: coincidence; plural noun: coincidences; 1.a remarkable concurrence of events or circumstances without apparent causal connection. 2. correspondence in nature or in time of occurrence. 3. Physics the presence of ionizing particles or other objects in two or more detectors simultaneously, or of two or more signals simultaneously in a circuit. Origin: early 17th century (in the sense ‘occupation of the same space’): from medieval Latin coincidentia, from coincidere ‘coincide, agree’ (see coincide). There is plenty of information covering this magical number 153, which will be left up to the reader to research. For this story we will be using 1+5+3 = 9 and 1 x 5 x 3 = 15, 1+5 = 6, we can see gives us our numbers 9 and 6 or 96 and 69. ( Reflecting Absence ) Here we will also find 9+6 = 15, 1+5 = 6, which was the difference in height of the twin towers. The word Human gives us the numbers 66111 = 15, some more words with this value are Gold, Eve, Blue, Monopoly, Beta, Wave, Enlil, Core, Palace and Hell. First this author wants to point out there were 7 disciples plus Jesus in this story which equals 8. The number of FISHES caught 153 ( F6,I5,S6,H6,E5,S6 ) if you look closely you will see in the word FIS HES 656 = 17, 656 = 17 the number of families who received no remains: 1,717. Another perspective is when we add the first two digits we get 1+7 = 8 same as the last two digits. In the word SOUL you will find ( S6,02,U6,L2 ) = 16, first two letters 6+2 = 8, second two letters 6+2 = 8 , whether you take 1717 1+7+1+7 =16, 1+6= 7 or 6262, 6+2 = 8, 6+2 = 8, 8+8 = 16, 1+6 = 7, you will still end up with what has been called the HOLY number 7. Why was building 7 outside of this block, was it not suppose to be destroyed or was it just to be the last of the three to stand or be put to rest? Let`s take a look at the number 88 and see what we find. The game of chess is played on a Chess Board which consists of 64 squares. This is also the mirror number for the 46 chromosomes donated by the male / female ( 29 ) which creates what is called the embryo ( 17) . ( C3,H6,E5,S6,S6 ) = 26, ( B2,O2,A1,R5,D4 ) = 14. 26+14 = 40, = 4, the number 40 ( F6,O2,R5,T7,Y2 ) = 22 , there are 22 bones in the human skull. All 4 planes were heading west ( W4,E5,S6,T7 ) = 22. Twin Towers of Living Light aka Tribute Of Light consists of 88 7,000-watt xenon spotlights in the shape of two squares that shine four ( 4 ) miles into the sky—the strongest shaft of light ever projected vertically into the sky. These two beams of light were first lit at 6:55 p.m. on March 11, 2002, on the six-month anniversary of the attacks on a lot next to Ground Zero. The memorial was first turned on by Valerie Webb, a 12-year-old girl who lost her father, a Port Authority police officer, in the attacks. Mayor Michael Bloomberg of New York City and Governor George Pataki of New York State were with Webb when she flipped the switch. The two towers of light are composed of two banks of high wattage spotlights—44 for each bank, which creates each beam of light. The lights point straight up. Each 7,000-watt xenon light bulb is set up in two 48-foot squares, mirroring the shape and orientation of the Twin Towers. This gives us our numbers 9 and 6 found in the net of 153 fishes. Each year the memorial is set up on the roof of the Battery Parking Garage near the World Trade Center. Battery Parking Garage Address: 70 Greenwich St, New York, NY 10006 – 70 Greenwich ( G7,E5,E5,N1,W4,I5,C3,H6 ) = 41, 70+41 = 111 , Phone: (212) 312-8800 – Tribute In Light = 70, Battery Parking Garage = 80, 70+80 = 150 = 15, 1+5 = 6, 1 x 5 = 5 our famous number of 11 is found here 6+5 = 11. I leave this for the reader to ponder. A Chess Game ( C3,H6,E5,S6,S6 ) = 26, ( G7,A1,M1,E5 ) =14, 26+14 = 40, is played on a Chess Board ( C3,H6,E5,S6,S6 ) = 26, ( B2,O2,A1,R5,D4 ) = 14, 26+14 = 40. Number 153 = 9 Pawn = 9. Xenon Light Bulb = 51, 5+1 = 6, more on this to come. All stories and games have the hidden story of the journey of the soul, come back to the conquering aka mastering of the number 8, as it is where you will find the truth within without. The number 8 hi-jacked the creation we call Man by impersonating or believing it was the ONE. This author is going to reveal why the Twin Towers were destroyed and how it actually has back fired according to his understanding. There have been many theories and much speculation as to whom was behind the destruction of the Twin Towers and the murder of many innocent individuals. First it needs to be mentioned these World Trade Center Towers represented male and female energy, duality ( you ) aka Jachin and Boaz two Pillars of King Solomon`s Temple. I have also found information stating these towers represented George Washington`s aka King Solomon` s Temple. Could these towers also represent the false profit and the beast mentioned in Revelation 19:20? Revelation 19:20 “And the beast was taken, and with him the false prophet that wrought miracles before him, with which he deceived them that had received the mark of the beast, and them that worshipped his image. These both were cast alive into a lake of fire burning with brimstone.” Brimstone is known as sulfur today. What this author calls the Game of Life is all about controlling energy ( ION ) which has been continuous for more years than we know. Control the energy and you control the GAME. For many of my readers who are familiar with how I find hidden meanings in words these first two paragraphs will be for your review. For those new this may help you understand. Gematria is a method of interpreting words, based on numerical values of letters. (Greek geometria) Every thing that is created by man involves mathematics, geometry aka Sacred Geometry (Pi). I find it interesting the words Gematria and Geometria when added using the cipher equal 70 and if we use decimal parity 7+0 = 7. Why is this significant, well if you spell out 7 seven it equals 22 and 22\7 = 3.142.. which is the closest known fraction to Pi (P3,I5 ) = 8. This writer will be using simple math aka addition, subtraction, multiplication and division in the work below. Please note this author will be using single words, symbols, such as : colon, – hyphens and word combinations when digging deeper down the Rabbit Hole. The official memorial to the victims of the September 11 attacks debuted in two parts. The memorial itself, a large open-air plaza, opened on September 11, 2011. Since then, more than 37 million visitors have taken in its two waterfalls (known as Reflecting Absence ) in the footprints of the fallen Twin Towers. Nineteen men hijacked four fuel-loaded US commercial airplanes bound for west coast destinations. A total of 2,977 people were killed in New York City, Washington, DC and outside of Shanksville, Pennsylvania. ( N1,I5,N1,E5,T7,E5,E5,N1 ) = 30, ( F6,O2,U6,R5 ) = 19, ( W4,E5,S6,T7 ) = 22. We will be looking into these numbers as this journey for truth continues. • 7:59 am – American Airlines Flight 11, a Boeing 767 with 92 ( 9+2 = 11 ) people aboard, takes off from Boston’s Logan International Airport en route to Los Angeles. • 8:14 am – United Airlines Flight 175, a Boeing 767 with 65 ( 6+5 = 11) people aboard, takes off from Boston; it is also headed to Los Angeles. These two flights are the only ones with the number of passengers on board equals 11 and further more, reducing it down one more time equals 1+1 = 2. These are the 2 that hit the Twin Towers. Here we also find the number 22. • 8:46 am – Mohammed Atta and the other hijackers aboard American Airlines Flight 11 crash the plane into floors 93-99 of the North Tower of the World Trade Center, killing everyone on board and hundreds inside the building. • 9:03 am – Hijackers crash United Airlines Flight 175 into floors 75-85 of the WTC’s South Tower, killing everyone on board and hundreds inside the building. Flight 175 – Flight 11 = 164, 1+6+4 = 11. The victims ranged in age from two to 85 years, this is a difference of 83 or 8+3 = 11. Peter Rabbit ( P3,E5,T7,E5,R5 ) = 25, ( R5,A1,B2,B2,I5,T7 ) = 22, 25-22 = 47, 4+7 = 11, also notice this article was posted on day 11 and the time is 11:11. Each of the WTC towers had 110 stories. 1 WTC (the North Tower, which featured a massive 360-foot-high, TV antenna added in 1978) stood 1,368 feet high, and 2 WTC (the South Tower, which contained the observation deck) was 1,362 feet high. We have a difference of 6 feet or 72 inches. Have you heard about the rule of 72? Reduced down – 1368, 1+3+6+8 = 18, 1362, 1+3+6+2 = 12, 18+12 = 30, 3+0 = 3, ( M1,A1,N1 ) 111, if we subtract 18-12 = 6. North = 21 and South = 27 a difference of 6. For the number 6 this author has only found three words thus far, RA AND LAMB or 666. Watch closely Father ( F6,A1,T7,H6,E5,R5) = 30. There are many words that relate to this article with the numerical value of 30 here are some for the reader to marinate on, Eight, Thalamus, Right, Ascension, Atonement, Nineteen, Crucify, Currency, Pinocchio, Arthur, Electron, Fetus, Sphere, Dimension, Masculine, Beelzebub, Genius, Messiah, Belshazzar, Magnetic, Esau Jacob, Baby Boomers, DNA Strand. Keep looking for the clues 111 ( O2,N1,E5 ) = 8, ( O2,N1,E5 ) = 8, ( O2,N1,E5 ) = 8. Well what do you know a trinity within a trinity. Total number killed in attacks in New York: 2,753, 2+7+5+3 = 17, 1+7 = 8, 17 babies were born on the site of the Twin Towers, 71 ( mirror number ) escalators and the number of families who got no remains: 1,717. According to biological science we know it takes 23 chromosomes from the male and 23 from the female to create an embryo. ( 46 ) For the number 23 we find, Heaven, Circle, Kingdom, Temple, Death, Grave, Dust, Wrath, Youth, Split, Fish, Mutant, Haploid, Mirror, Event and Eleven ( imagine that ) . For most readers this will be beyond their imagination ( I MAGI Nation ) and it is with great passion the authors goal is to help stretch beyond the obvious and look at all possibilities withing the Game of Life. We are just getting started so fasten up your seat belt and hang on for could be the ride of your LIFE. Below are some of the names and words we may be reflecting on in part 2 and where ever else the journey takes this author. This author said may be due to how much will be revealed. 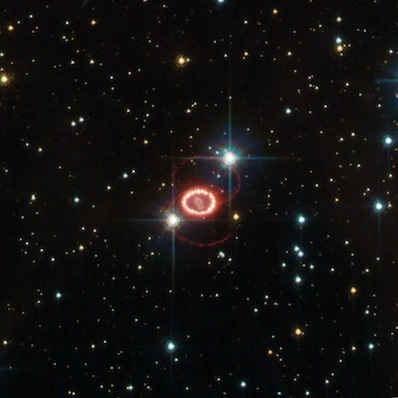 What Can We Learn From Super Nova 1987 A ? This article has been revised from one posted back on June 8 2015 titled Why The English Language Is More Than Just Words Part 6. I have always been fascinated with numbers, however while in school I had no real interest in learning the more advanced math like, algebra, trigonometry ect. For me there was no real use for this information or desire to know how to apply it in my life. Math for me was simple addition, subtraction, multiplication and division. I never dreamt that there was so much meaning in the English language other than the many different definitions for words. Well all that has change for this author as he has been learning more about sacred geometry and how all things are connected through the ciphering of the alphabet using gematria. The English alphabet has 26 letters and the number system for these letters are 1,2,3,4,5,6,7,6,5,4,3,2,1 for the first 13 letters A-M and the number system for the last 13 letters are 1,2,3,4,5,6,7,6,5,4,3,2,1, N-Z. Notice that the number 7 is in the middle of the each sequence. Seven is a holy number. Visit here Marty Leeds to learn more about how this cypher works. Gematria is a method of interpreting words, based on numerical values of letters. (Greek geometria) Every thing that is created by man involves mathematics, geometry aka Sacred Geometry (Pi). Now what I am going to share will either astound many or they will think that I am off my rocker. Either way just sit back and enjoy this as entertainment, truth or both. We will be searching for a message from Super Nova 1987 A and what it may be revealing to us below. Super (S6,U6,P3,E5,R5 ) 6+6+3+5+5 = 25 Nova (N1,O2,V5,A1 ) 1+2+5+1 = 9 spelling out these numbers 1987 One ( O2,N1,E5 ) 2+1+5 = 8, Nine ( N1,I5,N1,E5) 1+5+1+5 = 12, Eight (E5,I5,G7,H6,7 ) 5+5+7+6+7 = 30, Seven ( S6,E5,V5,E5,N1 ) 6+5+5+5+1 = 22, A = 1, this all sums to 107 using decimal parity shows us 1+0+7 = 8. This is a very significant number which is also known as the symbol for infinity. There is much more to be found in just these words alone which will have to wait for another article. Take a look at this image of Super Nova 1987 A from NASA. So What Could This Mean ? Moving on we find this in the Magellanic Cloud located in the constellation Dorado. Let us now see what this reveals. ( C3,L2,O2,U6,D4 ) 3+2+2+6+4 = 17, 28+17 = 45 = 4+5 = 9. Next up is Dorado ( D4,O2,R5,A1,DA,O2 ) 4+2+5+1+4+2 = 18 = 1+8 = 9. Interesting that this nova which adds to 8 is located in the divine number of 9. By the way Dorado means dolphinfish. We are now going to look at Vesica Piscis aka The Great Mother, Virgin Mary, Mandola ect and vessel of the fish. I have also found this to be spelled Vesica Pisces. So make sure your seat belt is fastened tight and your parachute is wide open. Vesica (V5,E5,S6,I5,C3,A1 ) 5+5+6+5+3+1 = 25, Piscis ( P3,I5,S6,C3,I5,S6 ) 3+5+6+3+5+6 = 28, 25+28 =53 = 5+3 = 8. Notice how the word Piscis when split Pis and Cis each half equal 14 which tells this writer the number two has now been brought into the picture. Looking at Phalanges ( P3,H6,A1,L2,A1,N1,G7,E5,S6 ) 3+6+2+2+1+7+5+6 = 32, as does Infinity, Trinity, Christ, Incarnation, Thirty, Pineal Gland, Divided and many more. Has this got you thinking outside of the box yet? Next we need to know about Vessel Of The Fish to help us understand this message from above. Or is this a hidden message from NASA ( N1,A1,S6,A1 ) 1+1+6+1 = 9 ? It will be up to the reader to decide. Starting out with the number 29 along with Vessel we find the following words, nothing, incarnate, Metatron, first, creation, male female, jubilee and to top it off Alpha Omega having the same numerical value of 29. Next up we have 23 the numerical value for Fish as with the following words, heaven, circle, eleven, kingdom, temple, death, allspark, dust and finally grave. It will be up to the reader to do the math if they so desire. As always don`t believe this writer do your own research. This author will let the reader use their imagination on how the numbers 29 and 23 may relate to their journey. This writer knows there is no end as to how the numbers from 0-9 express the Divine Creator. However it is very exciting to see how all things connect and go back to what many individuals call source. ( S6,O2,U6,R5,C3,E5 ) 6+2+6+5+3+5 = 27, 2+7 = 9. Just a couple of the many words that have the numerical value of 27 are light, white, Jesus, duality and Lamb Of God. Are you starting to understand who you really are? Like many of this authors articles it is a challenge to end them as they take on a mind of their own. He will do his best but first we need to go back to the number 78 found when adding Vessel Of The Fish. What we find next may be too much for some individuals and others may be able to understand, either way it is how this author receives his information and revelations. Here we go the numbers 7×8 = 56, when it was mentioned it was going to be exciting that was an under statement. Following are some words that also have a numerical value of 56, Pituitary Gland, Red White Blue, Father Mother, Nineteen Breath and Egg Of Creation imagine that. Not only does the number 56 give us 5+6 = 11 it is also the value of 6 of the first 7 prime numbers when we omit the number two. Recall how the number two entered the picture with the words Piscis and Pisces. Everything in the Holy Bible is trying to tell us about the number two. This writer will not expand on number two in this article. When it was discovered by this author the words mother and breath have the same numerical value a connection was made. Watch how this plays out Mother ( 127655 ) Breath ( 255176 ) the exact numbers in each word only in different order. This is understood to be the breath of the father or Master Creator`s breath or sound to crack the mother`s egg of creation. No further opinions on this right now. Just had to throw that in for the reader to think about. For those who believe that Jesus was here in the form of man a symbol he is associated with is called Ichthys. By the way the word Man gives us the awesome number 111 which can also be understood as 3, a whole book could be written about this and may have been. We must then see what Ichthys reveals. (5+3+6+7+6+2+6+ = 35) 35 = 3+5 = 8. Here we have that crazy eight again. This just won`t stop as now we have to look at some words that have the numerical value of 35, human being, genesis, earth air, Jerusalem, and Mount Sinai. Many Christians know of this symbol as a fish which is symbolic of Jesus. The Jesus of the New Testament will return as Christ as he is consciousness and thus we have the saying Christ Consciousness. Could this have been what many call the second coming? This writer understands this story about overcoming the desires of the flesh and learning how to do this doesn`t require a physical death as understood by most individuals. I challenge all my brothers and sisters to look much deeper within the words of ancient writings and much deeper within oneself for answers. We are all Christ and all we have to do is wake up our consciousness to come together as the one who IS. One for the road, Dolphinfish ( D4,O2,L2,P3,H6,I5,N1,F6,I5,S6,H6 ) 4+2+2+3+6+5+1+6+5+6+6 = 46. How many chromosomes create the human body? OK just a little fun to end as we split up the word dolphinfish we have dolph in fish. As I was ending this article I looked over at my email inbox and there were 46 messages waiting to be opened. You truly are the House Of God ( H6,O2,U6,S6,E5 ) 6+2+6+6+5 = 25, Of ( O2,F6 ) 2+6 = 8, ( G7,O2,D4 ) 7+2+4 = 13, 25+8+13 = 46. I leave you with love to ponder this. Know Thyself ! As Above So Below ! I have a good friend who when I share with him says I need to marinate on that for a while. Some resources from Marty Leeds, research from Google, NASA, Wikipedia and the writer`s perspective.